These are 3 targeted protocols (which I recommend beginning in addition to a juice cleanse) that I’m extremely impressed with. Most intense cleansing I’ve done in the past involves nasty tonics, TONS of pills, or really complex powders and expensive custom juicing that you have to piece together like a massive jigsaw puzzle. And the prices are usually super high. A note on fiber/staying regular while cleansing: If' you’re doing a liquids-only cleanse, please scroll to the bottom for details! For those of you who want SIMPLE and GENTLE, this cleanse is for you. 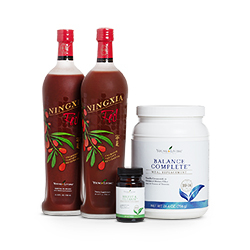 You’ll go through 2 bottles of NingXia Red (which I find to be blood sugar-balancing and energy-lifting in and of itself, a huge plus for weight loss) for this 5 day cleanse. There is SO much to be said about NingXia and its cleansing, cellular-supporting, antioxidant-rich benefits - it’s basically like juicing! You’ll use the Balance Complete meal replacement smoothie powder which covers your protein, fiber, and nutrient needs on the cleanse, and you’ll find you literally feel complete, not craving anything else. Keeps you full for a Really.Long.Time. The Digest+Cleanse supplement is included, with lots of oils that help cleanse, balance, and soothe the intestines, liver and gallbladder. People are absolutely loving this cleanse. If you’re on my team, check out our Oil Collective Facebook group to see the testimonials! Why: If you have ANY digestive issues, whether they’re mild or severe, you NEED to do this cleanse. If you suspect parasites/candida, you need this cleanse. If you have skin issues, you need to do this cleanse. If you struggle with weight issues, START HERE..then try the weight-loss protocols. Basically…this little trio addresses so many needs! When: I do this cleanse about 4 times a year, and feel AMAZING afterwards. I know it’s time to do the cleanse whenever I start experiencing lots of breakouts, food sensitivities, sluggishness or poor digestion. How long: I start this regimen off with my 3 day Suja juices/smoothies, then continue with the supplements here for 2 weeks, then 1 week off, then 2 weeks on, for a total of 5 weeks. What’s in it: 3 supplements. #1. ICP. I think this stands for “Intestinal Cleansing Protocol.” It’s a powder that I mix with water and drink 1-2x a day. This absorbs gunk from the intestinal wall and helps scrub it clean of bad guys and toxins that accumulate there. Plus there are some baller essential oils that are deep-cleansing and dangerous to the bad guys of the gut. #2. ComforTone. With Cascara Sagrada for keeping things regular while doing a cleanse, and bentonite clay for absorbing toxins and TONS of essential oils for deep-cleaning and killing off bad guys, I take between 1-3 of these a day while cleansing. Read more about the Cleansing Trio and details of the protocol here. The protocol is taken from a book written by Drs. Leanne and David Deardeuff, D.C.
#3. ParaFree. Parasites… We all have them, but that doesn’t make them ‘safe’. Eating pork, sushi, raw meat contamination in food preparation, being around dogs, cats, birds, rodents, and eating unwashed produce are the most common ways parasites infect us. And they’re the root of so many evils. They sap your energy, cause digestive issues and worsen candida infections at best … and at worst, can predispose us to cancer and chronic diseases. Don’t believe me? Research it for yourself. Start here, here, or here. Ok - I’m not usually a fan of or promoter of weight loss anything, because I know that the real underlying issue is typically a lack of exercise/hormone imbalance /toxic liver /parasite-candida related issue, depending on the person. I’m a “go-for-the-jugular” kind of girl, and I know that most “weight loss” protocols are TOTAL junk. Even the ones that aren’t junk boast of appetite-suppressants and metabolism-boosters…these are NOT weight-loss solutions, but band-aids. I highly recommend you do the Deep-System Cleanse above FIRST. 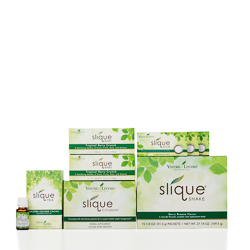 HOWEVER - I absolutely tip my hat to Young Living’s Slique system. Especially the CitraSlim caps. Check out this graphic showing a study with real results! They WORK. I did 1 box of CitraSlim caps, and lost an inch from my waist, hips, and belly in just 2 weeks doing NOTHING else differently in my routine. They’re amazing. I researched the heck out of the active ingredients and the chemical constituents, and in a nutshell - one of the secrets to their success is in how the essential oils and other citrus components effect the detoxification pathways and metabolism in the liver. It also helps to break down triglycerides which are stored in your fat tissue, which then gives us more energy. Plus, the oils of Fennel, Cinnamon Bark and Ocotea essential oils work to support healthy glucose levels AND curb sugar cravings…essential for weight loss! These meal options are SUPER clean, SUPER nutrient-rich, and will keep you nourished without reaching for empty carbs. With FRANKINCENSE (and all its miraculous powers) in the gum and the tea, along with all the other intentionally-selected ingredients, the tea and the gum were designed to curb cravings and rev your metabolism. The same can be said for the Slique Essence drops - add them to your water, and their oils will help burn fat, kill sugar cravings, and detoxify your body. They have several sets, but this one, Slique Advanced, is designed for 15 days. It would be good to pair with a 3-day juice fast/cleanse for starters. There is a money-back guarantee on the most of the sets as well, and if you purchase a 2 sets you will qualify for the “Slique in 60” challenge starting Feb. 1st, for $3000 cash and a 6 pack of NingXia! Visit the Slique in 60 page for more information, See our teams’ glowing testimonials on our Oil Collective Facebook page. It’s for real. PROBLEM: Doing a liquids-only cleanse can cause issues if you’re not getting fiber /bulk to keep things pushed through your system. Not eating anything at all can make your intestines pause for a while and get stopped up. (Not good.) We need to be doing regular “movements” at least 2x a day on a cleanse. SOLUTION: Each cleanse I list on this page has a “stay regular” solution in bold.